Single Incision Laparoscopic Surgery (SILS) is a novel approach to laparoscopic surgery. The advantages and safety of SILS are unclear. 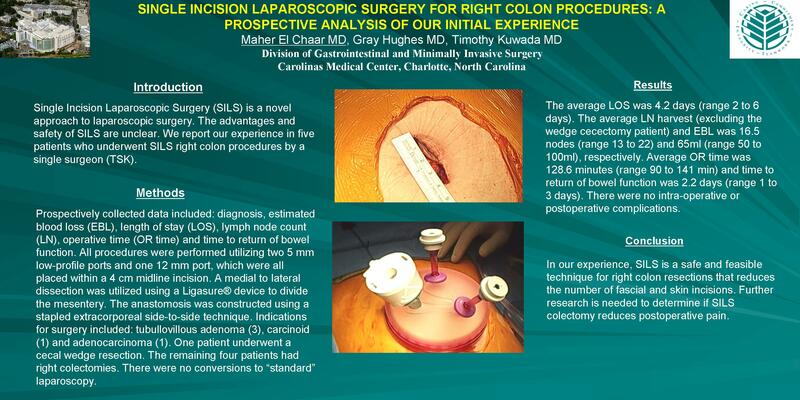 We report our experience in five patients who underwent SILS right colon procedures by a single surgeon (TSK) from October 2008 to September 2009. Prospectively collected data included: diagnosis, estimated blood loss (EBL), length of stay (LOS), lymph node count (LN), operative time (OR time) and time to return of bowel function. The procedures were performed using two 5 mm low-profile ports and one 11 mm port.all placed within a 4 cm supra-umbilical midline incision. A medial to lateral dissection was utilized using a 10mm Ligasure® to divide the mesentery. The anastomosis was constructed using an extracorporeal side-side technique. Indications for surgery included: tubullovillous adenoma (3), carcinoid (1) and adenocarcinoma (1). One patient underwent a cecal wedge resection. The remaining four patients had right colectomies. There were no conversions to standard laparoscopy. The average LOS was 4.2 days (n=5, range 2 to 6 days). The average LN harvest (excluding the wedge cecectomy patient) and EBL was 16.5 (n=4, range 13 to 22) and 65ml, respectively. Average OR time was 137 minutes (n=4) and time to return of bowel function was 2.2 days(n=5, range 1 to 3 days). There were no intra-operative or postoperative complications. In our experience, SILS is a safe and feasible technique for right colon resections that reduces the number of fascial and skin incisions. Further research is needed to determine if SILS colectomy reduces postoperative pain.